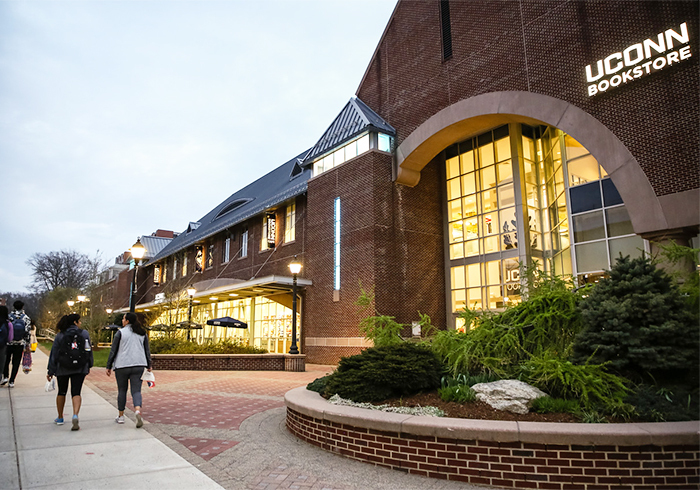 Two years into its partnership with Barnes & Noble College, the University of Connecticut has seen significant improvements to its campus stores, the student experience and college affordability. Focused on enhancing college affordability and elevating the student experience, University of Connecticut (UConn) Bookstores are beginning their third year in partnership with Barnes & Noble College. Within the first two years, the Storrs campus store underwent a major renovation, students embraced the stores’ community events, licensed Starbucks coffee shops opened in two bookstore locations, and the partnership saved students more than $1.8M through rental and digital textbook programs — and they are just getting started. Respecting all that the former UConn Co-Op Bookstore had accomplished, Barnes & Noble College wanted to continue its longstanding tradition of community support while taking the stores to the next level. Hiring the hardworking, knowledgeable and friendly UConn Bookstore staff was essential to ensuring a smooth transition. “In addition to our staff, one of the biggest successes the bookstore has had is elevating the experience. It’s the number one comment I get from any of our fans, visitors or alumni who come back to campus.” – Kyle Muncy, Director of Strategic Partnership and Business Development at the University of Connecticut. The newly designed Storrs campus college store is a sight to see. The massive renovation included a licensed Starbucks, a TechShop, computer repair and dedicated community spaces. Upon entering, students are greeted with a jaw-dropping display of emblematic merchandise that welcomes them to UConn Nation. However, ensuring a great student experience is about more than just an awe-inspiring bookstore design. 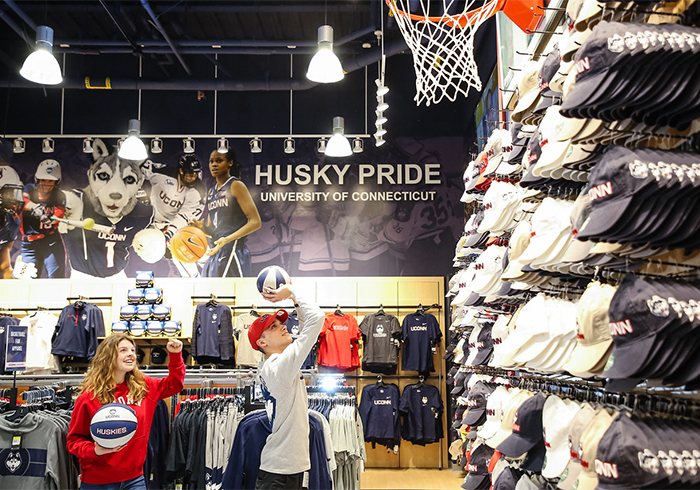 It’s also about getting to know the students and community and showing them that they are valued and welcomed — something the UConn Bookstore does extremely well. In fact, 92 percent of UConn students rated the bookstore’s overall performance as good, very good or excellent. From the moment students are accepted to UConn, the campus store is an indelible part of campus life. The stores are another campus resource, providing information, support, employment opportunities and a place to meet or relax. They also host a gamut of campus events that stretch far beyond normal retail. The UConn Bookstores’ events spark student interest and engage them in more campus activities. Author signings, special VIP nights for seniors and freshmen, the summer welcome resource fair and student de-stress events throughout the semester as just some of the events available to UConn students through the bookstore. 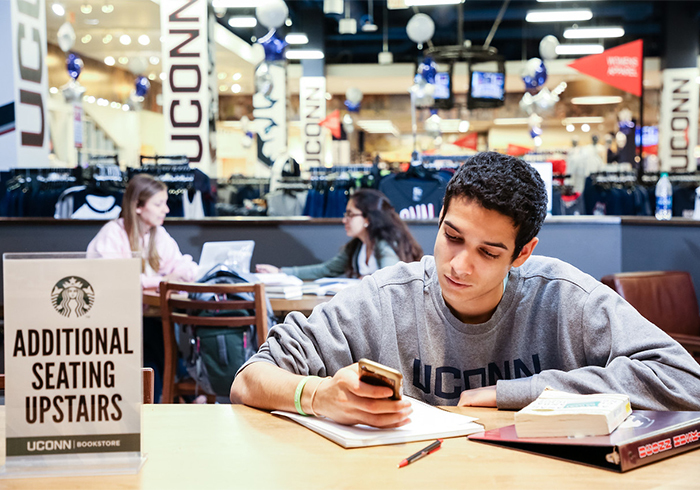 One of the top bookstore priorities for Oser was to make sure UConn students knew that they now had access to outstanding rental, digital and price match programs through their campus store. In a recent survey conducted by Cengage and Morning Consult on student affordability, 73 percent of the students said having access to course materials is more important than owning them, and 83 percent said that easily accessible digital course materials would have a positive impact on their grades. Starting with student orientation, the bookstores passed along best practices to help students and families maximize their savings. By explaining the available options, UConn students saved more than $1.8 million for last year’s Fall and Spring terms with rental and digital text programs. “Now, we’re working with faculty and staff throughout the university, explaining the value the bookstore brings to campus and how important it is to work with us to help the students get the most affordable textbook options,” Oser said. In the more than two years that Barnes & Noble College has partnered with the University of Connecticut, there have been significant improvements to the bookstore, the student experience and college affordability. The first year Oser and his team focused on making sure the transition was smooth for students, and faculty. The second year, the store went through a major renovation and focused on student engagement and affordability.